Still using toggles to turn on the lights? Try this sleek touch panel instead. In the early days of the smart home, few could have predicted that one of its biggest battlegrounds would take place at the light switch. Smart switches were originally concocted to simply dim and turn lights on and off, perhaps with a scheduling system built in. 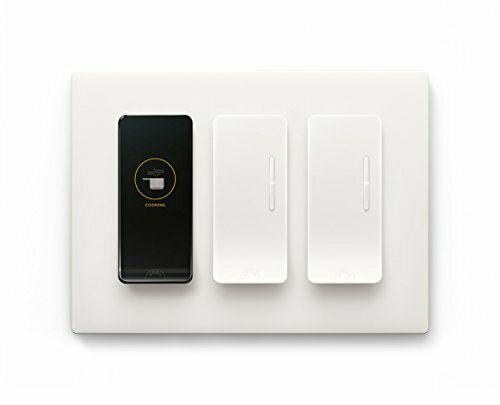 Today they’re able to replace or augment a whole host of gadgets, as evidenced by wildly advanced switches from the likes of Noon and Ecobee. The latest entrant into this fray is from Brilliant, a venture capital-backed startup that is launching with a single product line: the eponymous Brilliant Control smart switch panel. Available in one-, two-, three-, and four-switch versions, the Brilliant Control is designed to be far more than a mere lighting controller, thanks to a large touchscreen that replaces a conventional dimmer switch. I’ll get into the specifics of everything the panel can do in a bit. I tested two models of the Brilliant Control: a single-switch panel and a double-switch panel, both used in a three-way lighting configuration (unlike most smart switches, Brilliant will work with another manufacturer’s switch at the other end of the circuit, provided that other switch is not a dimmer). While the single-switch controller is 100-percent touchscreen, controllers with two or more switches incorporate touch-sensitive sliders on the side. 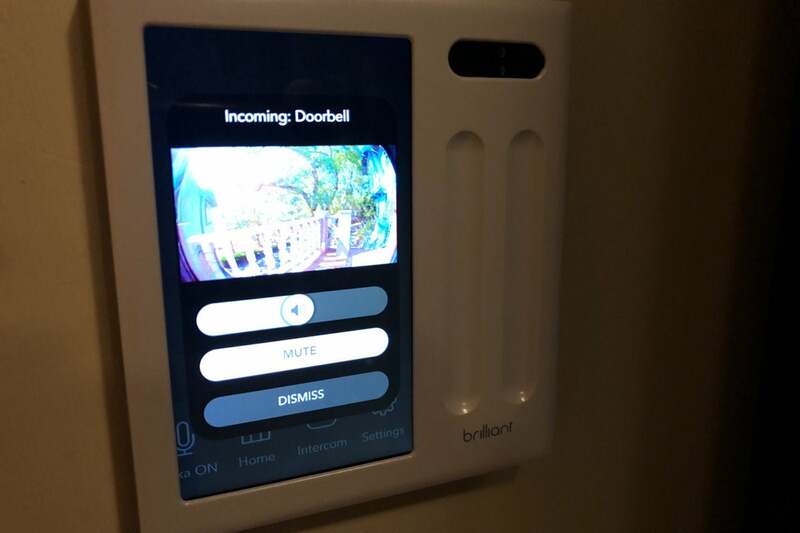 You use the touchscreen for smart home and lighting control, and the sliders work as dimmers for each of the other circuits you have connected, giving you a quick shortcut that becomes increasingly convenient the more switches you have. A Ring Video Doorbell can stream a view of your visitor to the Brilliant's 5-inch display. I found installing the Brilliant switches to be a bit more difficult than most of its competition, in part because of the uncommon support for three-way circuits, and in part because of the physical design of its wiring connectors. Brilliant’s backside features a number of stab-in holes into which wiring must be inserted to just the right depth (11mm, to be exact). [Editors' note: Brilliant initially provided us with pre-production units for review. The company says the product customers will receive has plastic retainers that eliminate the need for such precise measurements.] Wires must then be screwed in (tightly), with minimal exposed metal showing. Brilliant is very particular about this, but it can be difficult to accomplish because those screws are placed on three different faces of the device. 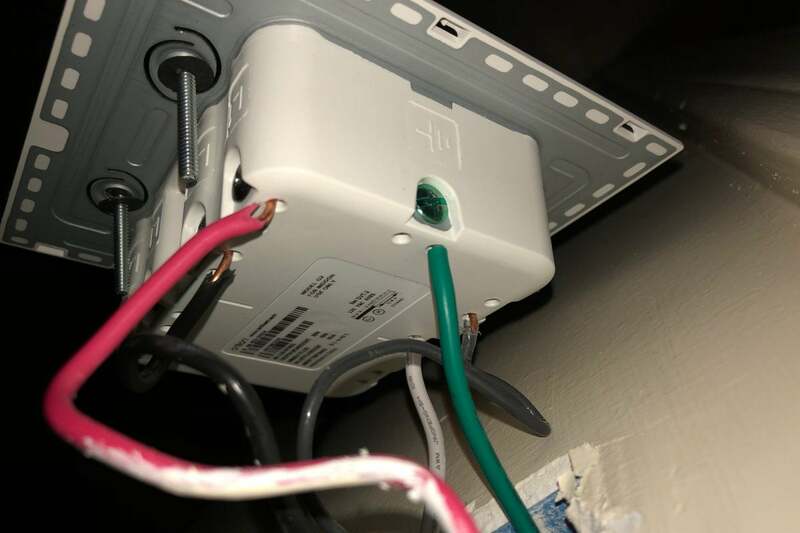 Dealing with a stubborn screwhead on nearly every side of the box can be very difficult, particularly if you’re working in a tight space, and it’s made more complex because none of these connectors are color-coded or clearly labeled. The printed manual is well-written, but some of the language feels geared more toward electrical pros than novices, so newcomers should keep that in mind. I installed both Brilliant switches on the same circuit in one room, after which I had what can only be described as an epic experience getting everything to work, spanning five days of troubleshooting. For two days things seemed fine, then suddenly my two-switch began spontaneously rebooting. This culminated in a multi-day tech support marathon that spanned holidays and evenings, pulling in everyone up to the CEO as we tried to figure out what was going wrong via conference call. All Brilliant switches require the presence of load, line, ground, and neutral wires in the box. The short version of that story is that having the two switches on a single circuit was ultimately problematic, perhaps due to some funky wiring in my walls. After replacing one of the switches and undertaking some clever diagnostic work—using tools that only Brilliant’s technicians have access to—everything eventually got up and running without further complaint. I think it’s fair to say that, outside of those working at the company, my house features the most heavily studied installation of Brilliant’s switches to date. With everything working, I was able to really tuck into Brilliant’s features. It is rather amazing on one hand, a bit frustrating on the other. But let’s start with what works. The switches are absolutely stuffed with features. Lights can be dimmed and, through the Scenes system, set to turn on or off via a schedule. 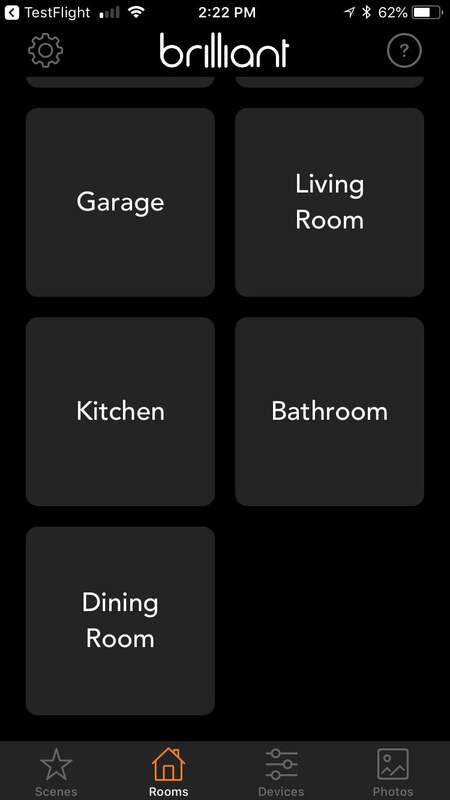 Each can switch also supports several smart home devices, all of which can also be tied into the Scenes system. Support includes devices from Philips Hue, SmartThings, Nest, Wemo, Ring, Ecobee, and Honeywell. Some of these devices appear within Brilliant’s room-based interface by default, some must be added manually and provided with login information, all of which is entered (sometimes tediously) through the switch’s 5-inch, 720 x 1080-pixel touchscreen. With these connections made, you can control other devices in the house directly through the switch, whether that means turning off a Wemo switch in another room, or—and this is cool—getting a live video feed on your Brilliant switch when your Ring doorbell is buzzed. Brilliant’s mobile app recreates much of the onboard experience and throws in a few extra features. Brilliant also supports Alexa and Google Assistant. 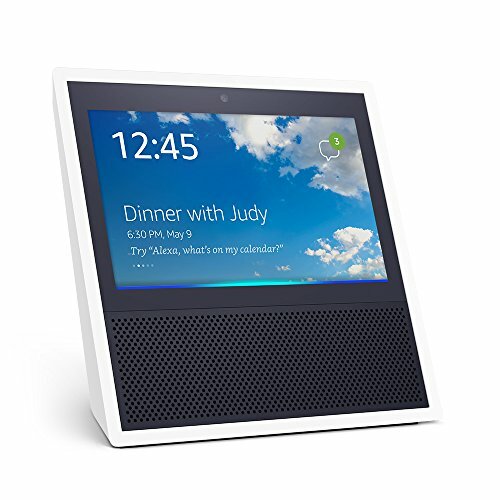 I tested it with Alexa and was impressed by how it responds with both audio and imagery (effectively making it work like an Echo Show). Asking about the weather doesn’t just tell you the temperature, it shows you a multi-day forecast that you can swipe through for more details. The caveat is that none of this works without an Alexa account: The Brilliant can’t tell you the weather on its own, it can only do it if you set it up to work with Alexa or Google Assistant. With a built-in camera and microphone, each Brilliant can work as a video intercom and can even be set to work as a nanny-cam or baby monitor. These features worked well in my testing, and there’s a shutter for the camera lens when you want to guarantee privacy. I was less thrilled with a feature that lets you upload your own photos to the Brilliant to display as a sort of screensaver-meets-digital-picture-frame. (If you don’t, it defaults to a handful of cheesy stock art shots, like pictures of puppies.) The problem: These photos must be painstakingly uploaded, one at a time, via a clunky part of the Brilliant mobile app—and you’re limited to a whopping maximum of 24 photos. And music is glaring, bare spot in Brilliant’s feature set. While you can control your Sonos multi-room audio system using the Brilliant’s touchscreen, you can’t use the device as a speaker. Similarly, Amazon Music—a staple of the Alexa line—is not supported. While Brilliant says its “built-in speaker was not designed to play high-fidelity music, so you cannot listen to your music through Brilliant itself,” this feels like a tragically missed opportunity. Ecobee’s tiny speaker built into the Switch+ is hardly a Klipsch, but it does just fine filling the room with music. Ask Alexa about the weather and Brilliant provides a full A/V experience. The Brilliant interface—both in the app and on the wall—feels a bit undercooked, with lots of trial and error needed to find key features. There are bugs here, too, such as controls for nonexistent “zombie” lights that are left behind in the interface if you reset or reinstall a switch. (Brilliant says this will be fixed any day now.) Motion detection—you can have the lights turn on when you walk by—was also a bit spotty and slow in my testing. 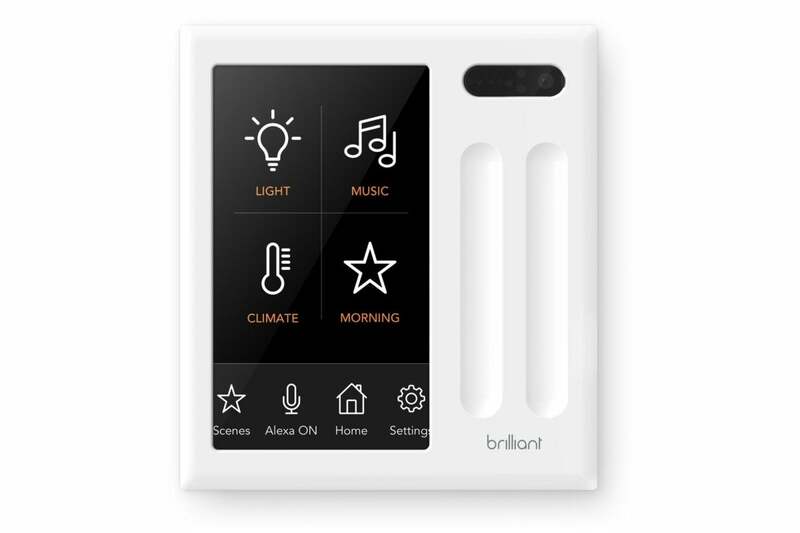 Brilliant isn’t perfect, and it can be challenging at times, but for a version 1.0 product, it’s a far better product than similar ideas, such as the Wink Relay or the Brightswitch, and I’m hopeful that future updates will iron out some of the kinks. On switches with two or more controls, touchpads on the right side of the switch let you dim connected lights directly by sliding your finger up and down these grooves. The only other smart switch in this league is Noon’s, though it’s a much different animal. While Noon is laser focused on maximizing the flexibility of the light sources attached to it, Brilliant is built around expanding what the switch itself can do. If you’re looking for a nuanced and relatively uncomplicated switch, Noon is your pick. 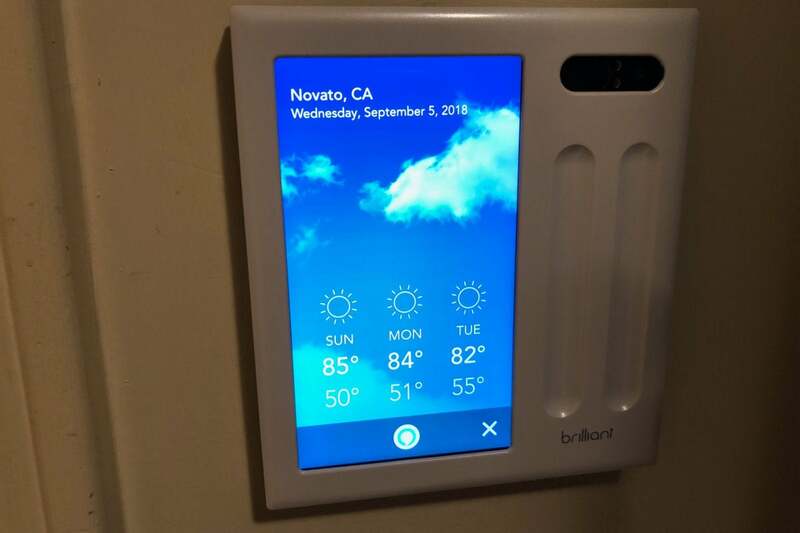 Brilliant is closer to a computer embedded in the wall that happens to also control your lights. 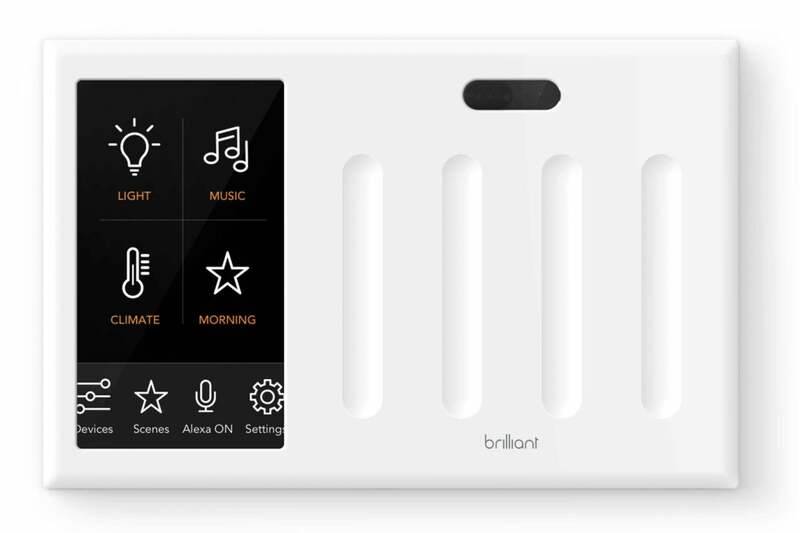 Installation may remain problematic for the foreseeable future, but the bigger issue is likely to be the price: At $299 for a one-switch panel, Brilliant is even more expensive than Noon’s $250 offering. That said, you are getting more features for the money, and multi-switch configurations are less-expensive than Noon: $349 for a two-switch configuration, $399 for three switches, and $449 for four. And if you have a lot of three-way configurations, Brilliant’s ability to work with third-party three-way switches might be a saving grace: Most other smart switches—including Noon—require you to purchase their own companion switch for the other end(s) of the circuit. Still, it’s a lot of money for a single light switch, even if you can command it to tell you a joke. Note: This review was updated on September 7 to add a detail about the production units that consumers will receive. This story, "Brilliant Control review: Impressive blend of switch and smart home controller, but there’s room for improvement" was originally published by TechHive. Brilliant’s screen-based smart light switch has incredible aspirations, but some kinks still need to be ironed out.